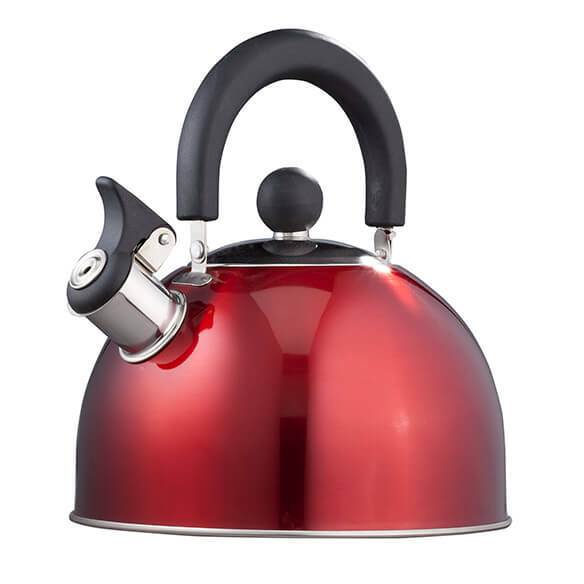 Glossy red whistling tea kettle by Home-Style Kitchen™ adds bold style to your kitchen. Quality stainless steel heats quickly and evenly. 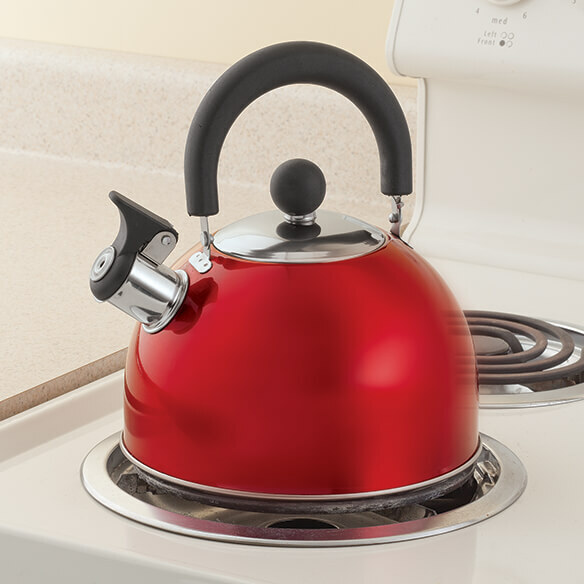 This red tea kettle whistles when water is boiling and ready to serve, with a flip-top spout for safe, easy pouring. Handy Bakelite handle eases lifting and folds down for compact storage. Durable stainless steel tea kettle won’t rust or discolor, so you can enjoy years of service. Holds 2 quarts. Hand wash. I love my little red tea kettle. I would buy this tea kettle again. I've never had a whistling tea kettle before this one. I don't know a lot about them, but I like this one. It seems to work fine .. heats water fairly quickly. I love my new tea kettle! The quality construction, reasonable price, and pretty color makes it winner! Nice whistle and pour device are icing on the cake. I can make more than one cup of tea at a time. Prettier than its photo-I love it! It isn't always convenient to use a microwave, especially for more than just one cup of anything. You can simply pour what you need without carrying cups back and forth. It is very attractive to sit quietly too! heats up very fast love the way it looks to cute. I love this product! It's attractive, well made, and was very affordable! I bought this teakettle to replace a sturdy, Reverware kettle that had seen better days. I love the bright red color and the styling. I'm less happy that it seems somewhat flimsy and it seems to take longer for water to boil. There is a funny smell when you boil water in it - even though I washed it thoroughly before the first use. The smell seems to be getting less strong over time. The whistle is also not very loud. Overall, for the price I paid I'm satisfied.